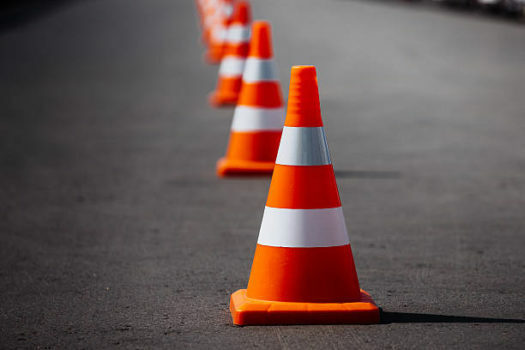 Oranges cones and barriers now help guide traffic during morning drop-off. Since the final months of last school year, Parkdale adopted a new morning drop-off system. This system, which was headed by principal Dr. Graves Henderson and Sgt. Ruff, had resulted in gridlock traffic within the schools parking lot and the surrounding Good Luck Road. Many older Parkdale students can remember a time where morning drop off didn’t move at light-speed but also didn’t drastically affect a student’s ability to make it to first period on time. The new system, which was enacted with the intentions of increasing students’ safety when walking across entryway to the school parking lot, now has all parents, teachers, and buses traveling in the same direction, causing some teachers to temporarily park in visitors’ spots and parent to drop off their children in the staff parking lot itself. The result of this system was nearly unmovable traffic in the Parkdale entrance and parking lot. Especially with the issue of late buses at Parkdale, if a student’s bus didn’t pick them up at the scheduled time,then it was nearly inevitable that they would not make it to first period on time. It wasn’t only the students who were affected by this system but teachers as well. It wasn’t uncommon for teachers to be stuck on the hill for at least 15 minutes. More specifically, the Annex teachers were incredibly disadvantaged by the system. Since all teachers have to walk through the front door in order to sign in, Annex teachers must park their cars, go sign in, get back into the their car and go to the school’s back parking lot. This seemingly minor inconvenience had greatly affected their morning routine. Although the main objective of the drop off system was to keep students safe, when parents stop their cars in the middle of the parking lot to drop off their children, it halts traffic and can be very risky for the child, as most of these drop offs are abrupt and instant. Some parents elect to have their children sprint across Good Luck Road than to suffer through the Parkdale traffic. While it may have its downsides, the new system did improve some of the safety concerns were present with the older system. Before, school security didn’t play a major role in guiding traffic, but now they’re the ones who control the flow of it, trying to assure that no injury occurs for students or teachers who are walking amongst the traffic. “They’ll stop cars from moving so that teachers and other students can cross the parking lot into the building,” said the anonymous Annex teacher.